Apparently, the White Collar writers spent their week off thinking about ways to incorporate 30 seconds of uninterrupted product placement for sponsorship partner Ford Focus into “Payback.” As I’ve discussed in previous roundups, Collar has strained to integrate the auto-maker’s sedan into its action dating back to season one. But Jesus, they really killed the momentum of a satisfying late-episode car chase by comically halting and zooming in on the back of Diana’s hybrid. This somehow paled in its awkwardness against her and Neal’s ensuing, pointless exchange, which used the Focus’ green efficiency as a metaphor for their chances of saving a kidnapped Peter. McCall, like so many of Collar’s bit-part antagonists, is an unremarkable on-screen presence and hardly intimidating, as Peter humorously acknowledged himself when comparing Keller to Dustin Hoffman’s Ratso Rizzo weasel from Midnight Cowboy. Yet despite the actor’s limited range and Keller being a mere pawn in an open-and-shut FBI bust, he’s featured front-and-center throughout the episode. From within his Paul Cicero-worthy cushy cell, he literally and psychologically (groan) engages Neal and Peter in a chess game surrounding his being pardoned from a federal transfer in exchange for valuable information about a colleague printing up fake U.S. passports. Fortunately, Adam Goldberg was a casting free agent after the premature demise of his last major network gig in The Unusuals, and he was brought on board to portray said forger, the mustachioed, bandanna-as-neck-tie pioneer Jason Lang. Dependable as always, Golderg brings his signature Christopher Walken jumpiness and, dare I say it, unusual likability to a role that is inexplicably second fiddle and red herring to Keller’s circuitous schemes. Gruff but even-keeled character actor James Rebhorn (The Game, Meet the Parents et al.) is also back this week as Agent Hughes, grounding the departmental scenes with an authority that belies throwaway lines and almost sheepish acquiescing to Neal’s constant undermining. This was not, however, one of my favorite Collar episodes and would actually rank as my least favorite since its second season resumed in January. There was a lot happening in its 44 minutes—Peter being kidnapped, Neal and Keller matching wits, a whole lot of business revolving around Peter and Elizabeth’s failure to communicate about dry cleaning—and having several different threads hinge on Keller as featured puppet master felt like a waste of superior ensemble talent. Consequently and jointly, for the first time in a long time, Collar actually dragged in spots. own cliffhanger but lately has been dangling in the show’s trademark breeze. Here’s hoping next Tuesday’s penultimate hour delivers more than a promoted guest appearance by Richard Schiff, and here's to assuming we’ll see our friend Ratzo Keller this time in 2012. Unless, of course, that whole world-ending thing comes to pass. Ratso Rizzo was referenced in both my crossword and Collar this week. Seems like people are Dustin off the classics. Am I right or am I right? “Well, we’re all in a prison of sorts, aren’t we?” Boo, Ratso Keller. “We’re not gonna release Keller on an anklet. Unless June has an extra bedroom.” Peter “The Zinger” Burke rides again! The whole honey/hon thing might be cheesy, but I shuddered at how absolutely true the regression of affectionate semantics is between married couples. “Damnit Keller, this isn’t a game. Of course it is. Life is a game.” To paraphrase Keller at episode’s end, we’ll call that verbal crossfire between he and Neal a draw. Neal apparently wants his kids to enjoy pretty crappy playgrounds. 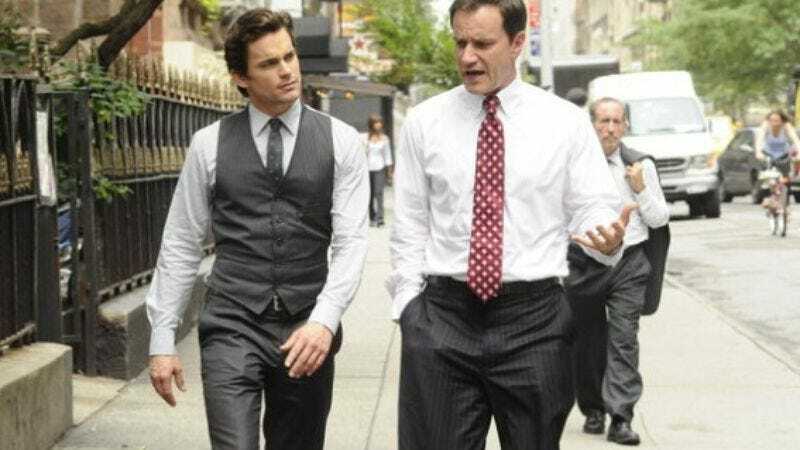 Sorry, Bomer-lovers, but when Neal serious-whispered to Mozzie that, “Keeping Peter alive’s more important than holding a candle for someone who isn’t,” it sounded more like an out-of-sync overdub than a statement of conviction. “The longest relationship I’ve ever had was 11 days… and then she deflated.” Take my anatomically correct plastic wife, please! Speaking of Mozzie, I know he was an afterthought tonight, but his character could do better than using je ne sais quo without irony. If this FBI thing doesn’t work out, Neal would make an amazing tech-support phone rep.